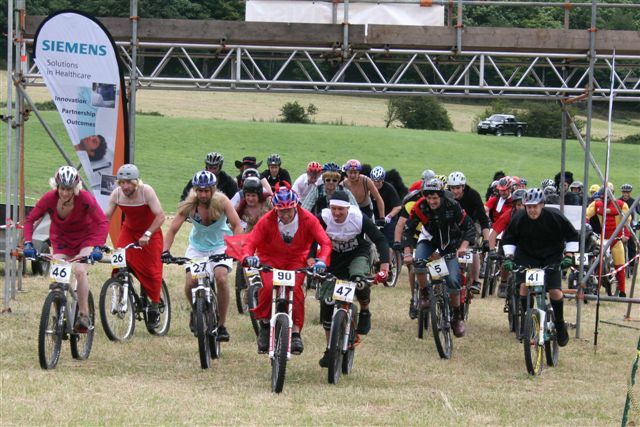 The start of the very first Wharncliffe Weekender I'm number 90, Lee Bertram 47 in the nuns outfit went on to be masters downhill world champion Andrew Titley british champion 5 as a punk rocker and Tristan Tunstall Masters downhill british champion, not to mention Steve Peat dressed as a gorilla. Also in the field were Roy Tomlinson as a seventies throwback Craig Mckay as a bee and James Butler as a vampire. A really good event that raised a lot of money for Weston Park hospital in Sheffield, It would be nice to do it again if it can be started up again.